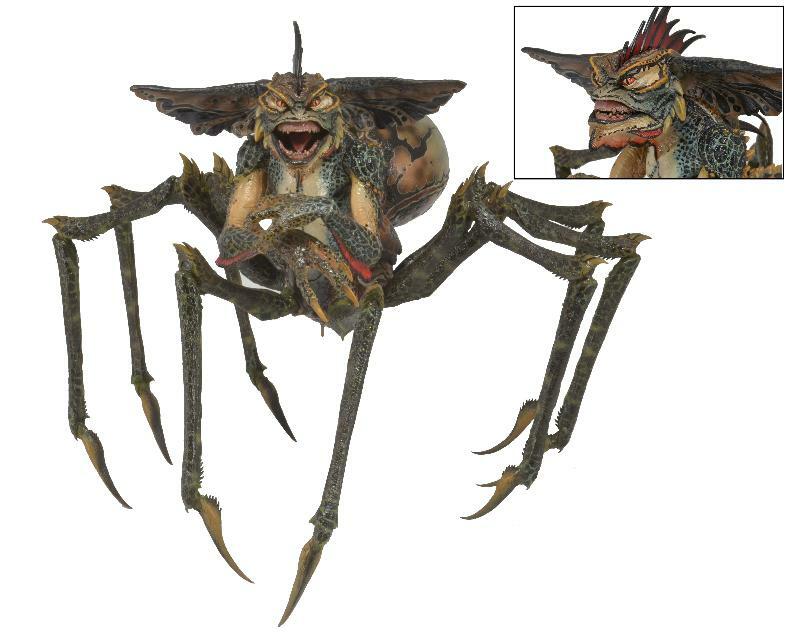 Pre-Orders Available for NECA’s Mohawk The Spider-Gremlin! | Gremlins Online! Pre-Orders Available for NECA’s Mohawk The Spider-Gremlin! Finally after much begging and pleading with NECA for additional Gremlins figures, we see something even better than a new series of 6″ figures, Mohawk arrives this October, and looks better than we could have imagined. These should be retailing between $49.99 and $59.99 depending on your store. When fully assembled, the Spider Gremlin stands over 10″ tall and is nearly 15″ across and over 12″ deep! It is enormous and full of detail! An incredible re-creation of the puppet seen in Gremlins 2: The New Batch, the Spider Gremlin features a hinged jaw, ball-jointed shoulders, elbows, and wrists and 8 massive spider legs that are also articulated in 3 places each! In total, over 30 points of articulation! Also includes a support stand to help balance and display him in your desired poses. Here is the catch, this is a one-time order that must be placed by July 8th. If you want this figure, and you want to show stores that Gremlins is a money-maker, then get out there to your local hobby/collectible stores (Not Toys R Us, not eBay, etc) and tell them you want them to order this figure.Why order locally? Supporting your locally owned hobby stores in this day and age is an immense show of respect for those that help the collectibles community exist. Local stores are where the action is, where people gather and discuss their favorite nerddom or play games that you may not have even known exist or introduce you to a comic that isn’t necessarily the hottest, but has something special to offer. These are the stores that will continue carrying a product like Gremlins even while the big box stores or internet discounters discontinue them in favor of whatever is newest. They will carry it because they know that you personally will come in for it. You know what? Having been on both sides of the counter, it just feels good. It feels great getting that unusual item for a small group of customers that really appreciate it. It also feels fantastic as a customer when you are remembered walking in the door and appreciated for your quirky hobbies. So if you can, support your local hobby/gaming/collectibles/comics/toy stores. Show them that Gremlins fans have money and want to spend it in their stores. Keep the toy line alive! I’m needing help trying to track down the location of both Billy and Kates house in The Gremlins? I am really struggling to find this. I’m not sure if it is on the warner or universal backlot? That actually is a good question, I believe almost the entire film was shot on the Warner studios studio property, as most of the town square was re-used for Back To The Future and other films as well. I will look further into this and let you know!